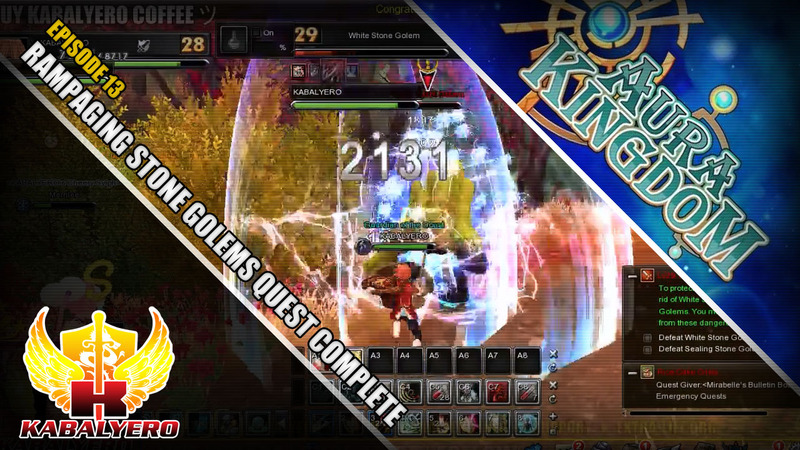 Rampaging Stone Golems Quest In Aura Kingdom Online - KABALYERO - PLAY, BLOG & EARN! Stone Golems are monsters or creatures in Aura Kingdom Online and the Rampaging Stone Golems Quest is a quest to hunt Stone Golems down. My character had a pending quest and it was the Rampaging Stone Golems Quest. The quest had two objectives, the first one was to defeat five White Stone Golems and the second one was to defeat five Sealing Stone Golems. To get to the Quest Area or Quest Location, I used Aura Kingdom Online's Auto-Pathing Feature. This feature automatically summoned my ostrich mount and, together, my character rode to where the Quest Area was automatically. ► Is your country blocked from accessing Aura Kingdom Online? If it is and you want to play the game then get pass through the country block with Hotspot Shield Elite. The first objective was to defeat five White Stone Golems and these Golems were big. Not too big or giant-like but they were big. Bigger than my character but they were easy to kill or beat. The same goes with the second objective, defeating five Sealing Stone Golems was not very difficult. The Stone Golems were big but they're not that strong and were easy to beat. After completing both objectives of the Rampaging Stone Golems Quest, my character went back to the Quest Giver and completed the quest. My character also got a new quest and I will tell you guys about in my next blog post or even video.